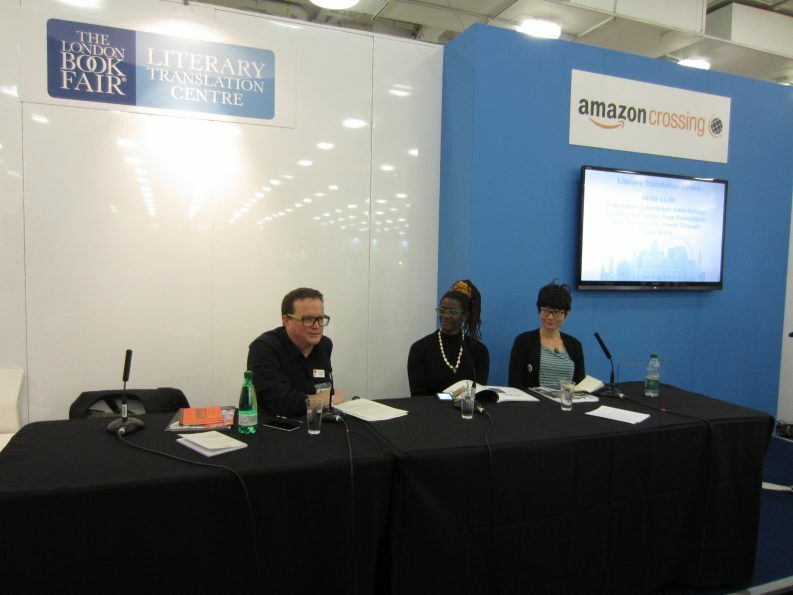 ‘Translators play an essential role in raising awareness of writers’ plight’ in many cases of peril, as was discussed in an #LBF16 Insights Seminar session. Translation was discussed — both as activism and in addition to activism — in one of many well-attended Literary Translation Centre sessions, Translator as Activism: From Politics to Cultural Change, How Translators Are Changing the World Through Their Work. 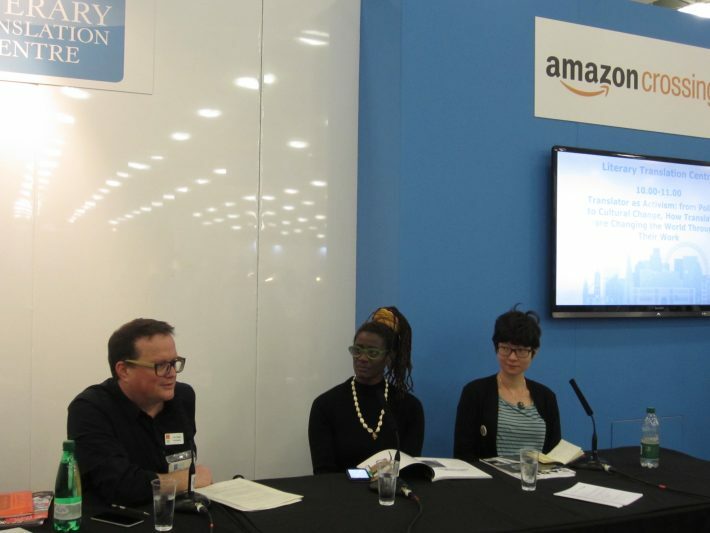 Erica Jarnes, who manages the Writers in Translation program at English PEN, and Kadija (George) Sesay, poet and publisher of SABLE LitMag among other activities, discussed translation with moderator Chris Gribble, Chief Executive of Writers’ Centre Norwich. PEN writers all over the world are often at risk from violence. Translators play an essential role in raising awareness of their plight. Jarnes gave the example of Cameroonian author Enoh Meyomesse, whose poetry was translated and published while he was in prison with the help of PEN translators. When he was released he said that knowing his poems were being read outside Cameroon helped him feel he was being supported. “Translators have helped us urgently translate articles on freedom of expression by journalists from Mexico or Turkey,” said Jarnes. PEN is working on formalizing an online resource for translator/activists with safety and legal recommendations but also as a way of communicating with each other. There also have to be serious discussions prior to translation about the personal risk to each individual writer following international publication, said Jo Glanville, director of English PEN. But translation can also be activism in simply working to get more voices from other countries published in English. For Khadija Sesay who grew up in England with Sierra Leonean parents, translating African languages to English is important as an educational tool for children of immigrants. Sesay is also actively working on getting African languages translated into other African languages and cited the extraordinary success of Kenyan author Ngũgĩ wa Thiong’o’s short story The Upright Revolution: Or Why Humans Walk Upright which appeared in a Pan-African magazine and was consequently translated into 30 different African languages. Given that there are close to 2,000 languages in Africa, the magazine is now considering a special translation issue, which will publish a story and ask authors and translators to translate into a variety of African languages. “English speakers want to read more and more work coming from other places. It’s good that people feel it’s not something distant from them,” said Sesay, adding that there was more and more collaboration between writers and translators, developing a real community. There is solidarity between writers, said Jarnes. “Within this community, you can decide what your voice is, where you’re coming from and whether to get your message across to as big an audience as possible. We support over 200 languages getting translated into English. Many of these writers tend to be established authors in their own countries. Translators are also being taken more seriously as writers and public intellectuals with important information to impart, in particular translators who can explain situations in areas of the world where there is interest today. Alice Guthrie, who translates contemporary Arabic literature, wrote an article on the meaning of the word Daesh, or Isis, which was widely read. Finally, literary translation plays a role in community engagement, said Sesay, who does work in primary schools encouraging children to tell stories in their own languages.